The Local Sudies Library at Matlock holds "Plan of the township of Middleton in the Parish of Wirksworth and County of Derbyshire, 1843, John Bromley, Surveyor, Derby". The scale is about 25 inches=1 mile, and the map is 840 mms x 900 mms. They kindly supplied me with a photocopy of this map, and I drew an OS grid onto it for use on this webpage. 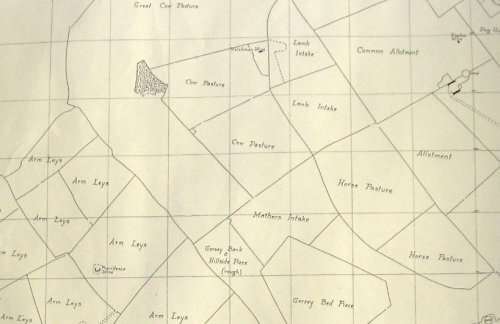 A small section of John Bromley's 1843 map of Middleton-by-Wirksworth. OS grid has been added, squares are 100 metres on a side. The plantation shown is at 2645-5575. Many fields have the same name. Centre of fields is referred to by the SW corner of the grid square. from 1841 Tithe Awards and documents from Chandos-Pole-Gell collection.